Since Valentine’s Day was on a Monday this year, Andy and I celebrated early by going out to dinner on the Saturday night before that. So that meant I had time on Valentine’s Day to make a quick dash over to Westgate and snap a few shots of other celebrations of the day. Shot with my Nikon D700, 50mm lens, F/2.8, 1/1600s, ISO 200. Processed in PaintShop Photo Pro X3. I love the little 50mm lens and the depth-of-field possibilities it provides. I just need to practice with it more to be more selective with where I’m focusing. Fortunately, this one turned out just like I wanted it. I’m planning a day-long photoshoot for Monday since I have the day off. The hubby and I are planning to ride the light rail from one end to the other, getting off at different stops along the way to shoot some urban scenes and possibly indulge in some midday libations. Should be fun! 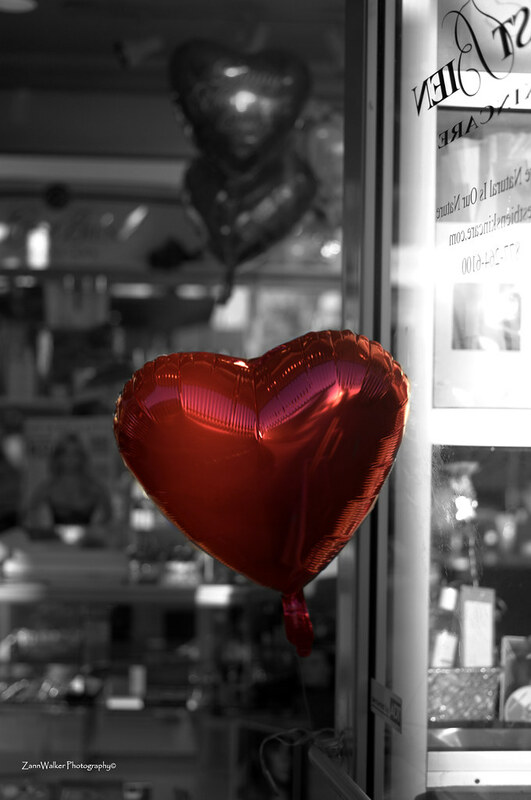 This entry was posted in Shooting and tagged Arizona, AZ, B&W, balloon, camera, color popping, D700, depth of field, Glendale, heart, Paint Shop Pro, Photomatix, Valentine, Westgate. Bookmark the permalink.